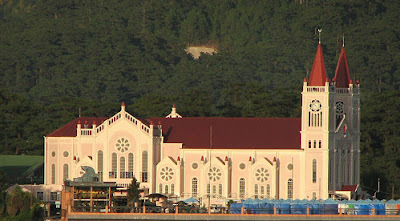 The Baguio Cathedral beautifully built is located at the top of the hill is one of the most photographed and visited landmarks of the city. It is a rose-colored Catholic church which has twin spires that makes more captivating. It is accessable by pedestrians who would step more than a hundred times in a long concrete stairway of ascension. Church goers and tourists who would not dare to get weary because of the long climb can use access road. If Burnham Park is great for relaxation, the Cathedral's for spiritual refreshment. Everytime I go to Baguio City, I always have to see the church. I really appreciate this place especially the climbing. Hi I was just doing a bit of bloghopping and found your site. Good job! I love your photos. Great page! It is about time to have a really good site (pictures and descriptions) about Baguio. Please visit NEW and EXCLUSIVE free ads site for Baguio City residents! Baguio is really nice! I love it. I also like the parks in Baguio and guess what there will be a good program. baguio trip is not complete without going here. such a nice church.